The above view shows St. Jerome's church at Alexander Avenue and busy East 138th Street in Mott Haven, The Bronx. Not everyone arrives by town car. Stairs from the Third Avenue station of the #6 subway train are to the right of the photographer. The above view looks north on Alexander Avenue from East 137th Street. At the next corner is St. Jerome's church. In the foreground is Saint Jerome's elementary school, which the archdiocese closed in 2013. The rectory is between them at 230 Alexander Avenue, Bronx NY 10454, telephone 718-665-5533. It appears that neighboring St. Luke's parish will be staffed from St. Jerome's by August, 2016. On 4.1.2015, Archbishop Dolan appointed Fr. Javier Correa-Llano, I.V.E, pastor of St. Jerome's. A native or Argentina, he was ordained in 2001. On the 138th Street side of the church is this shrine of Our Lady of Guadalupe, patroness of Mexico. On a weekday afternoon, I found the church locked. In Msgr. Shelley's book, please see page 230 for a reference to Italians at St Jerome parish in 1893. On pages 292 and 293, there is a more lengthy description of the establishment of St Jerome parish in 1869 under Father John J. Hughes. By 1871, he constructed a school on Alexander Avenue at East 137 Street. 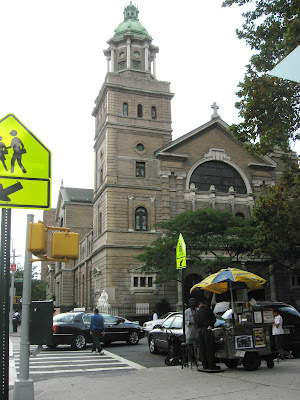 The present church on the southeast corner of Alexander Avenue and East 138 Street dates from 1900. For many years, Ursuline Sisters staffed the school. For decades after 1928, the Brothers of the Christian Schools taught the older boys. Page 558 contrasts Mass attendance in 1950 (6,100) and 1975 (795). Page 586 describes the parish in difficult times. See also page 606 for recent restoration of the church. About 2007, Archbishop Egan entrusted this parish to the care of the Institute of the Incarnate Word, a congregation founded in Argentina about twenty-five years ago. They, "the IVE fathers," also staff St. Thomas Aquinas parish, Crotona Parkway, and St. Michael parish in East New York, Brooklyn. An excellent professional photographer has posted about 200 of her photos of St. Jerome's on Flickr, as linked here. Her photo of the Eye is here. Another photographer offers an interior shot from the altar steps to the main doors, linked here. The AIA Guide and other places give the church architect as the firm Delhi & Howard, but the spelling is wrong. Please see this brief biography of Arne Dehli. Dehli, from Norway, designed quite a few impressive buildings in metropolitan New York. Aquinas High School, East 182 St.